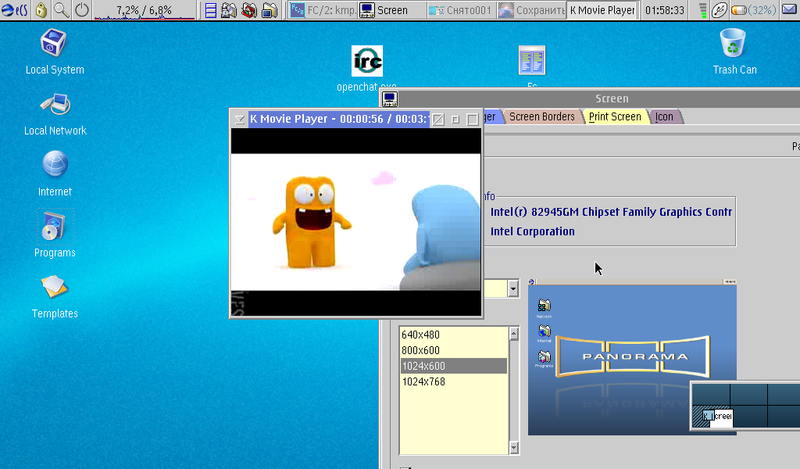 It's an operating system for PC computers (with Intel and AMD CPU). Q-2: Linux distros are free, eComStation costs money. Can it compete and attract new users? A-2: eComStation's main advantage is ease of use. It is less complicated for an average PC user. To keep your operating system operational, minimum knowledge is required. We seldom have a so called "DLL (or Dependency) Hell" problem, User Interface is stable and changes slowly and most importantly - we have a very friendly user community. Q-3: What are your plans for the next 2 years? A-3: This May eComStation 2.1 is released. Development of 3rd generation of eComStation is beginning. PC world has changed again - we'll have to update several subsystems of the OS. All resources will be aimed to development of device drivers: eComStation's advantages are only obvious when it is executed on a real hardware (not emulated inside of virtual machine). Q-4: Is eComStation aimed to education use? Is it possible to use eComStation in schools? A-4: We've been asked about such possibility every month. We recommend to start from utilizing REXX scripting language. The next step is up to teachers and students: they might create training and educational software based on eComStation. Q-5: Developers often ask: Is it possible to finance development from donations only? A-5: Our experience shows that develop applications using donations is almost impossible. Set the right price for your program, sell it using online stores (even if the price is $5). One can sell sponsor units (donations) of $10, $50. One of 20 buyers will donate. Q-6: Does eComStation have any "own" modern technologies? A-6: No, we have to admit that we don't have new technologies. We're still using the technologies developed by IBM back in the days when it invested millions of dollars in OS/2. New technologies (such as libraries) are mostly "imported" from Linux/FLOSS world. Improving User Experience, developing new standards and libraries is quite possible though. We expect to gather a team of professional (and non-smoking) developers from around the world as eComStation market grows. And these developers will be able to restore eComStation's position on operating systems market. Q-7: Do you have any plans to offer OEM partnership to hardware manufacturers? A-7: Pre-installing the OS is the best (and only) way to extend eComStation market. Unfortunately, it is hard to make customers to buy computers in particular stores or from particular brand. Hypothetically, eComStation works on any PC (though, see list of compatible hardware), which means that user can go to a nearest store and buy high quality and/or cheap hardware. Although, we are ready to work with hardware manufacturers first of all to test hardware compatibility with eComStation.